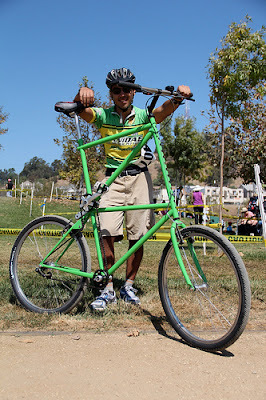 My best bet would be Hammer Time @ Bonelli, race it, then book it with family to CicLAvia. I am thinking I take the Tall Bike! As much as I would love to race CX in Temecula, it would really take up most of my Sunday. If I race Hammer Time, I could effectively be done by 11:30 to noon then just head out to LA. I've seen video of CicLAvia and it looks like a lot of fun. I don't think I've ever seen so many people on bikes in one area. Shoot, I could even see my Grandma and sister in LA as well. Hmmmm, Hammer Time and CicLAvia is looking more and more promising.